Leading a hobby group can be quiet a taxing, thankless task. People are working, they have other commitments and often there’s lack of motivation to keep the them coming back and dedicating time to the hobby. Then, with photography, Instagram and other social media engage photography enthusiasts so well that there’s no vacuum for the passion left that a group can fulfill. Given so many constraints, how does one lure members to keep coming back to the group? Well, here are a few tips to help you keep your group together. Understand what brings people to the group: It’s a photography group, so an interest in photography is quiet obvious. But still, each person could have different motivation, for instance, one person might be wanting to take up professional photography while the other person might just be there for the love of it. once you know what people want, you can organize sessions accordingly. Chalk out a plan: Once the expectations are set, a detailed plan that defines the raison d’etre for the group and clearly states the achievable target by a certain time. If there is no defined benefit from the group, in all probability the group won’t last long. The group’s purpose needs to be clearly identified. Arrange interesting activities: Organize engaging activities like street photography, beach walk, nature trail, a day in the garden, automobiles and mean machines, inside the house and so many more different types of photography sessions. Keep everyone engaged: Groups tend to break-up if there’s lack of activity and communication. Since people have busy schedules and have too hectic lives for hobby and pleasure, it is imperative that the group activity is so indulging that people look forward to it, it’s like a stress buster exercise for them. Keep interesting, engaging communication going, have activities, picnics, fund raisers and more. The only consideration would be to time your communication and activities well. Too much or too little will tick people off and the group will finally disintegrate. Encourage participation: Nothing makes members feel more involved in the group than when they participate and take ownership of the task assigned. Don’t try to do everything by yourself. Ask for volunteers who can help, people who are keen on participating and you’ll be surprised to see the response. 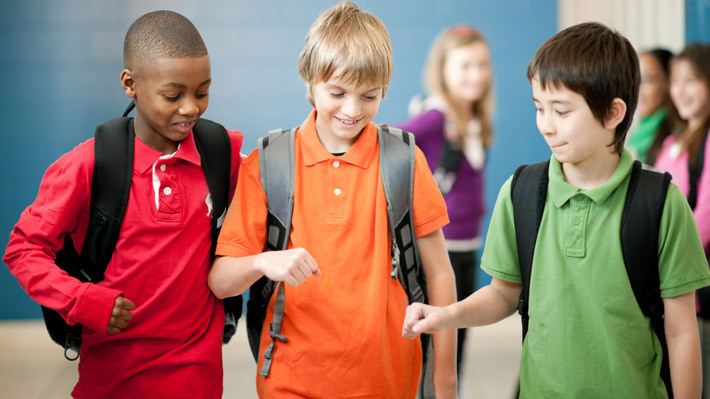 Seek help in organizing, problem solving and other group tasks. Meet Coach McKinney, Todd McKinney. Winner of Coach of the Year Award during Elizabethtown Youth Baseball National Tournament held in June in Elizabethtown, Kentucky. Although, if you read the excerpts of the coach’s interview, you will notice the coach credits a lot of it to the way their whole group, athletes, coaches and parents behaved during the tournament. Like every tournament there were logistical nuances, arrangement issues and performance highs and lows. But the Mineral Area Orioles Baseball Team, all its members, supporters, parents, staff and its leader, Coach McKinney, everyone was supportive and understanding throughout the tournament. They dealt with adversity with utmost grace. No one created a fuss about the hotel being changed or threw tantrums when the going got tough for the team. “We are going to be respectful. There are always going to be bad calls, even on the professional level, or maybe you were the one that was wrong. Either way, we are not going to disagree in a disrespectful way. Our kids are not going to see their coaches or their parents losing their minds yelling, screaming and saying things that are inappropriate”, said Coach McKinney. This does not imply that they took all silently, but they dealt with it in a dignified, respectful manner. Coach McKinney and his group set a great example for all sports teams and parents, especially in youth sports. While we look at sports as a great way of learning for our kids, we must also see this as a great platform for us, elders, to set the right examples for our little ones. It’s about coaching not just sports but life skills to kids, and reminding parents and coaches that not just their game but their behavior also goes into making your kids the athletes and the people they become. The game matters, but the experience matters more. And the experience, the life skill, the team-player spirit, the unselfishness, grace, respect, all of it comes from role models, not coaches or parents, but role models who live these virtues themselves. All parents know it. They might not admit it but the day their kid gets into a sports team and from the day they start writing checks for the kid’s sports coaching, parents develop this secret ambition – scholarship. Some might admit it, some might not, but that’s the underlying yearning for almost every parent (although, I’m yet to meet an exception). Well, maybe it’s natural with the soaring expenses and shrinking savings. But that still does not justify meddling with your kids’ life, trying to get into their psyche, pushing them into competition and teaching them winning is everything. Sports is a way of life. If kids learn from winning, kids learn from losing equally well, if kids learn competition, they learn sports-spirit. Falling, failing, trying, giving-up for something that’s important too, sacrificing, all of it is important too. If you agree with this but cannot control the obsessive, compulsive parent instinct, here’s a list of things you can do to promote a healthy sports talent in your kid. Cut out – No talking doesn’t help if you are still hearing, hearing every single comment about your kid’s performance, hearing about all the pressure tactics other parents are putting their kids through and hearing all the advice the so-called wise parents have to give. Just cut out from all that, and your life as a parent will be a lot easier, let alone your kid’s life as an athlete. Let coaches coach, let players play – Lets face the fact here. Pay for the training doesn’t really make you in charge of the training. Friendly advice is different but telling the kid how he should play the game or teaching the coach how to coach would not really come across as you intend it to. Not when it’s repetitive. You’’ have to sit back and relax. Let the kid and his team figure it out and believe they will. Let the kid cry – Crying is a natural emotion and a healthy one too. It’s actually one of the simplest way a person lets out their anger, frustration, sorrow or any negative emotion. It’s literally like washing it out. And once the crying is done, there emerges a kid who’s learned a lesson or promised himself a change. 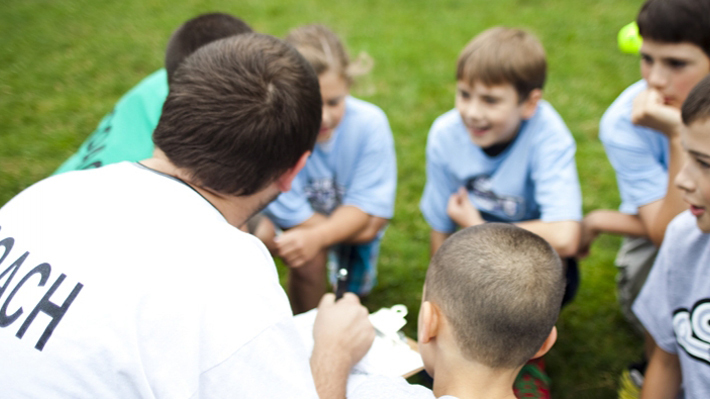 Youth sports is more than just the game – It’s your kid’s window to the real world. There will be adversities, bad day, failure, dropping the catch, missing the free throw and so much more. But that really is the best part. All the learning, the grooming and preparing for the game and life comes from dealing with these adversities. Schools contribute to way more than just academic education of students; there’s sports, drama, dance, projects, field trips, camps and so much more. Parents are real proud when their children participate in more and more in of these school activities, but at the same time, it becomes quiet a task for parents to keep up with everything - practice sessions, events, outings, meetings and all. It’s not just about keeping up with the events, there’s communication and coordination with the school and other parents involved too. So much of keeping up cannot be done without the help of technology. Emails aren’t effective as most of the mails go unread, or the message gets lost in the long trail of reply-all emails. Text messages are not a practical solution to bringing the concerned teachers or coaches, students and their parents together on the same platform. Electronic calendar might be great for event reminders abut does not solve the communication and coordination issue. So does it essentially mean that to work together as a team, we need 4-5 different tools or applications? This is where a team app comes to the rescue. Team apps like InstaTeam combine the capability of different tools to provide a single platform that does everything from communication to coordination, and everything in between. 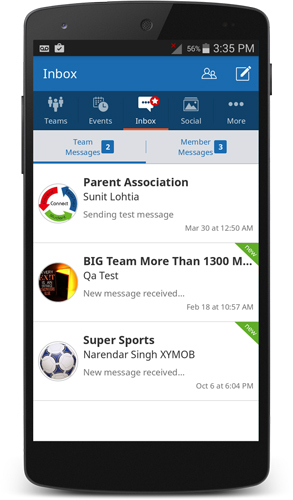 These team management apps help schools conduct activities smoothly while involving and engaging parents to contribute positively. Improve communication between parents and teachers. Teachers can communicate real-time with parents. Every message is sent as a notification on the mobile phone along with an email. Parents who actively use their smart phones can see the message instantly, and parents who are not active on their mobile phones get the email. So no message goes unread. More so, teachers can send bilk messages in one go. Parents can also interact with teachers real time, ask questions, doubts etc. The whole communication process becomes simpler and faster. Parents involved and engaged in school activities more. This contributes positively both for the child and for the school. Parents know what is going on and thus have more confidence in the school. Event notifications and reminders ensure that no event is forgotten, either by the kid or by the parent. Holiday notifications, project announcements, due date reminders etc. ensure regularity and efficiency. InstaTeam allows parents or kids to interact with one another through one-on-one chat without compromising number privacy. A great step in ensuring safety. The school website can be integrated with the app. Any change or update in the events calendar or schedule is auto synced and immediately reflects on the website. Although these are compelling enough, but there’s lots more that you can do with an app. Need to know more, write to us at support@instateam.in. 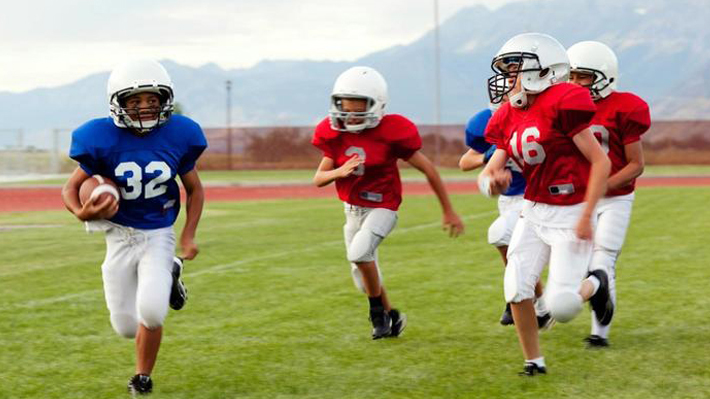 There are millions of (around 30-45 million) American kids who participate in youth sports every year. And the number, along with the percentage of participation goes up every year. It’s an impressive number especially with benefits like health, attitude and personality attached to youth sports. But there’s an underlying concern here. 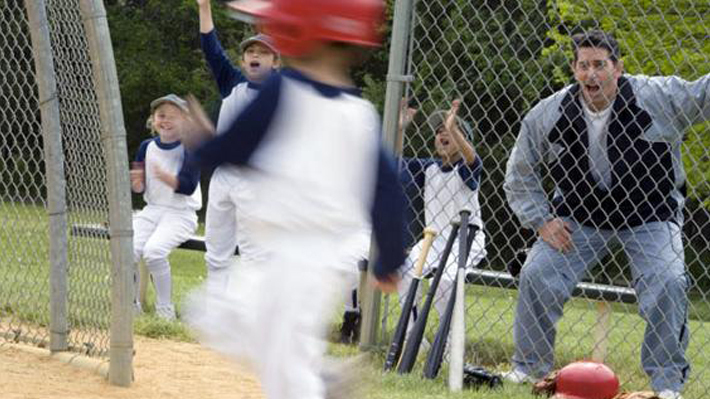 Youth sports is not just about sports and fun anymore, it’s serious business. It’s indeed concerning to see that parents are taking up professional sports training for their kids at a very tender age. There are championships, leagues and tournaments being held for kids as young as 7, sometimes even younger. U.S. Kids Golf World Championship has a category for boys under 6, professional basketball, football, swimming etc. training taking place for kids at 5 even younger. Parents want their kids to be focused, trained and professional from the start. More and more kids are being made to train only in one sport and coaches sell their professional and expert services to parents showcasing the talent they have groomed and success stories they have created. Parents have their own motives. There’s hope for a college scholarship, there’s ego and pride involved being a star athlete’s parents and above all, everyone else is doing it, no one wants their kid to be left behind, although that’s ego too. But there are more serious issues involved here. In this mayhem of competition and professionalism, a child’s childhood is getting lost. Kids do not get to play what they want, when they want and how they want. Playing isn’t even attached to the game, it’s synonymous with competition. The aim is to win every time. There’s shame and disgrace attached to losing. And kids don’t play for the sake of playing anymore, they play to win. At ten the child’s future is decided. What if the kid grows to like something else? Shouldn’t talent, interest and liking be nurtured naturally, as and when it comes? And a very serious concern, sports expose kids to the risk of serious injury. Concussions, for instance, have become more frequent than ever. All this causes a serious threat of emotional, mental and developmental issues in children. Encourage your kid to participate in sports, a variety of them, whatever interests her. If your kid has a special talent, it will find her. You wouldn’t have to get a professional opinion on it. See signs of fatigue, both mental and physical, and give your kid some time off. Spend time talking to your child, listening to her, playing a game of their choice once in a while. This will bring in a lot of emotional security in the child, which will help in overall development and progress of the kid. Give a break and take a break. Call Sunday a no-sports day. Or maybe some time off during the year when your kid does not play, just gets some time for herself, some perspective. Its important for you as a parent too. Do not make your child a part of a very competitive team, a tyrannical coach or hard-core sports club. 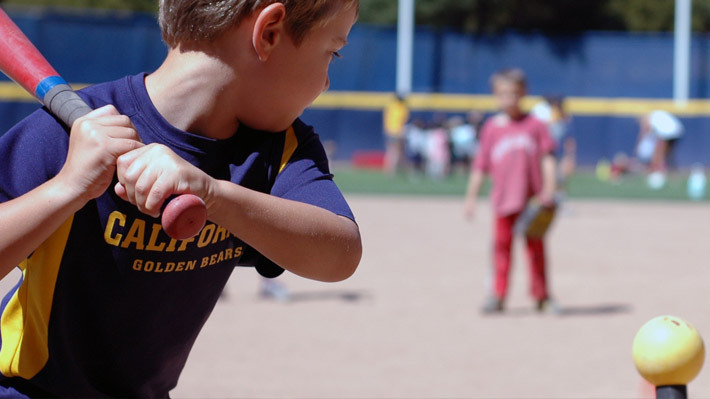 Sports clubs or teams for kids must have some child-friendly practices. Be a supportive parent. Let kids lose one in a while. Let them have their moments. Don’t be demanding, interfering or win-obsessed. It’ll do more damage than good. InstaTeam is a great way to connect, communicate and collaborate with your team. 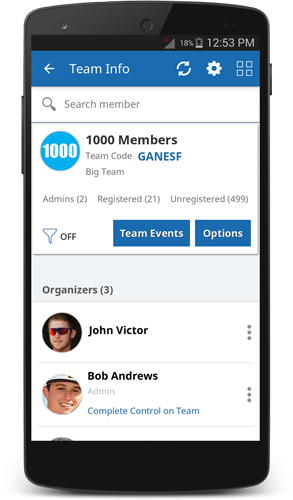 Create team calendar, set team events. scheduling, rosters, event reminders, notifications, instant messaging along with email, message read status, real-time schedule change updates, website integration with automatic website updates, payment tracking, attendance record, Facebook, Twitter and other social sharing, carpooling with integrated maps and do so much more, everything in a single interface. With InstaTeam, team life is easy and fun. 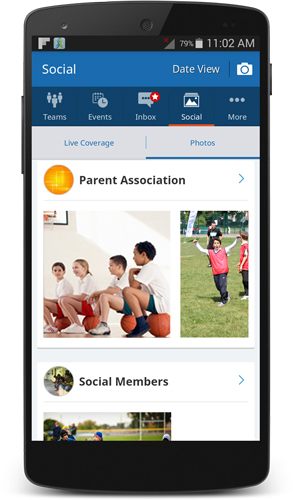 Get one-stop destination for all important team information – including team schedule, team roster, events, calendars, photographs, social media and important announcements – then easily and quickly share it with your team or the world. Go to Google Playstore or iOS App store, search for InstaTeam, select and download the InstaTeam app. As you tap/click on the app, you will land on the ‘Teams’ tab. The list below will show you the teams that you are a part of. To create/join new teams, tap or click on ‘Add Teams’ written on the right-hand top corner. Fill in the required information and within fraction of a minute you can join your team. To create a new team, click/tap create team. 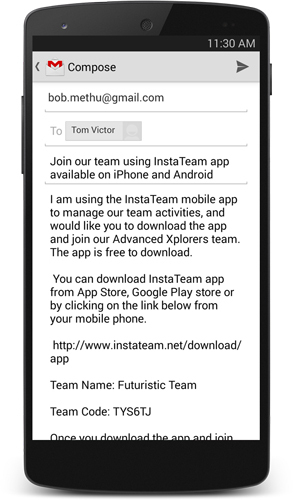 Fill in required information and you have your own team on InstaTeam. Bravo! This should not take more than a minute or two. Now you are ready to add members to your team. When a team admin sends you an invite to join their team, you receive a notification. You can choose to accept or decline the invitation. As soon as you create a new team, you are given the option to add members. You can add a member manually, from another team or even from your address book. Your team is ready. Get the excitement started! Select the team you want to add event/s for. When you tap/click on ‘Team Events’ tab, it will show all events of the team. Event filter refers to a basis of selection or order in which you want to see the events. For instance, you want to see all Practice matches for your school team, you can put in the filter by tapping/clicking on the funnel icon. You can also turn OFF or ON depending on your preference. To create an event, tap/click on the ‘+’ sign on the top right corner. The app will ask you for details of the event, its name, type, venue etc. The app will also ask if you want notification sent for the event or not. You can see all the events for your team in the list below. You can also see who all are going to the event. You can send reminder for an event by tapping/clicking on the list of a particular event. Messages can be sent by tapping/clicking on the message tab. 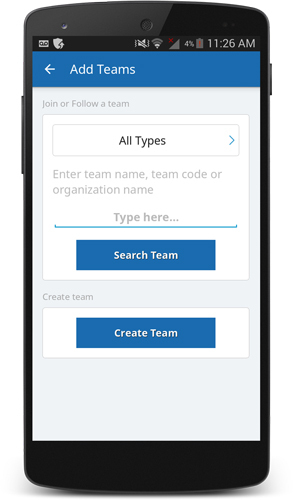 Tap/click on create message and the app will prompt to ask if you want to send message to the whole team or to a member or group within a team. InstaTeam is so much more than a fancy PDA or calendar app. InstaTeam helps you collaborate socially, carpool, keep live coverage of events, and also get an update on the offers and deals from the local businesses in your vicinity. Tap/click on the Social tab. You can view photos, share them on social media and also upload photos a live event. 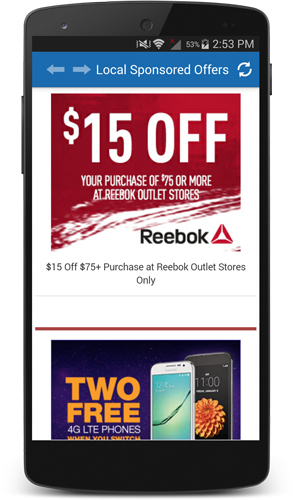 By tapping/clicking on ‘More’, you can view sponsored deals and offers of local businesses in your vicinity. Go local.